Fight acne without over-drying your face with Neutrogena ON-THE-SPOT Acne Treatment. This medicated acne spot treatment is lightweight and absorbs quickly into skin. Neutrogena ON-THE-SPOT Acne Spot Treatment contains just 2.5% benzoyl peroxide, yet is clinically proven to be so effective that skin starts getting clearer on day 1 all without over-drying, stinging or burning skin. This acne-fighting formula goes deep down into pores to kill acne bacteria that cause pimples and helps stop new ones from forming. 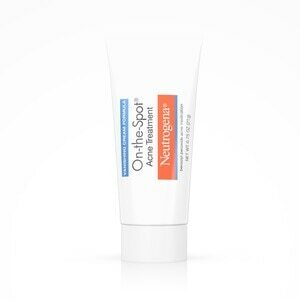 This spot treatment has clinically proven effectiveness with no burning and wont dry out skin. Clean the skin thoroughly before applying this product. Cover the entire affected area with a thin layer one to three times daily. Because excessive drying of the skin may occur, start with one application daily, then gradually increase to two or three times daily if needed or directed by a doctor. If bothersome dryness or peeling occurs, reduce application to once a day or every other day. If going outside, apply sunscreen after using this product. If irritation or sensitivity develops, stop use of both products and ask a doctor. When using this product, skin irritation and dryness is more likely to occur if you use another topical acne medication at the same time. If irritation occurs, only use one topical acne medication at a time. Avoid unnecessary sun exposure and use sunscreen.